Tireless Anambra State politician and former Governor of the state, Dr. Chukwuemeka Ezeife, has raised a serious issue bordering on the federal government’s claims that it approved N1bilion, part of which had been spent, in readiness for the burial of former Vice President, Dr Alex Ifeanyichukwu Ekwueme. The late elder statesman is billed for final interment on February 2 in Oko, Anambra State. It would be recalled that the Minister of Labour, Dr. Chris Ngige, was quoted as saying that the Federal Government approved N1bilion, part of which had been spent,. As at Tuesday, the Chairman of the South-east burial committee, Prof. Simeon Ortuanaya, denied that his committee has received assistance from the Federal Government’s N1bn in planning the burial. He noted that “We were shocked to hear that. We did not see any such money. We read it from the newspaper”, he said.The Anglican Bishop of Enugu Diocese, Rt. Rev. 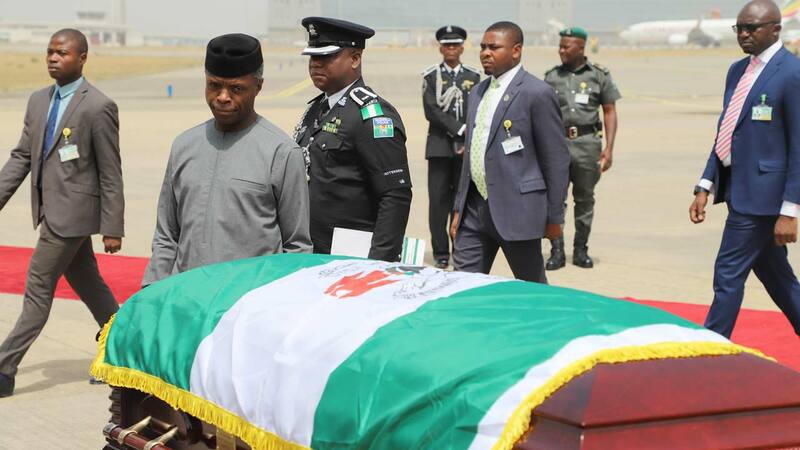 Emmanuel Chukwuma, who was part of the dignitaries that received Ekwueme’s remains at the Akanu Ibiam, Enugu airport had queried the claim as “unacceptable.” He said the Federal Government should explain how the N1 billion was spent, stressing that the late Ekwueme, being a man of accountability, would not be happy with such an amount being spent on him, especially in the face of the infrastructure challenges in his South-east region. Expressing his views on the N1bn federal allocation for late Ekwueme’s burial, the Emeritus President of a pan-Igbo organisation, Aka Ikenga, Chief Goddy Uwazuruike, said “I think it is incredible news. It’s too fantastic. I can’t imagine the Federal Government spending such on a man his family single-handedly took care of while he was sick as well as ensured that he was flown abroad. If you are building a new road to Oko, of course that is expected because you need the road to pass through. If you are rehabilitating the Akanu Ibiam Airport that is also expected. But to bury Ekwueme with such an amount is unthinkable.